There are two sides to Augmented Reality. Snapchat Lenses and Pokemon Go are the examples of the more obvious one: entertainment. And while this fun side is not limited to any mobile platform, the other one – the practical one – usually is. Facebook Camera Effects and Snapchat Lenses were created merely to bring joy to the users and give companies an opportunity to promote themselves using this kind of entertainment. Meanwhile, a few useful AR tools, like eg. a measuring app have found their place in the App Store and Google Play. 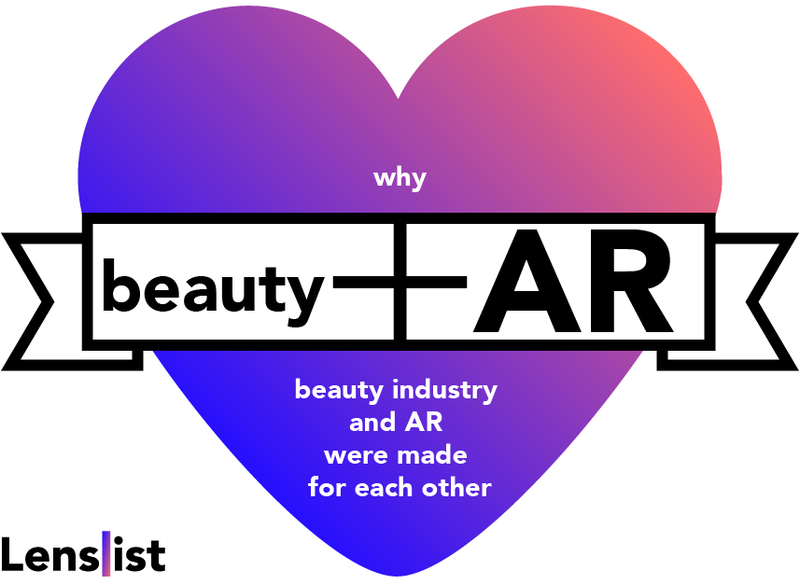 There is one industry, though, which is already able to bring AR marketing, fun and practicality together: the beauty industry. The great emphasis on the face filters put in both Snapchat, Facebook and Instagram AR services resulted in creating the perfect tools for customers to try on makeup products with the detailedness, simplicity and usability beyond compare to any other items. You can see how you would look like with the chosen makeup, without the need to go to the beauty store or remove make-up afterwards. And then, you can ask your friends if they like it by sharing the photo with the effect on. The question occurs: what to choose? An Android or IOS app, Snapchat Lenses, or Facebook Camera Effect? In the article from a year before Ilyse Liffreing presents the story of Rimmel Company, which started to experiment with AR by developing an app, which lets you virtually try on makeup. It wasn’t very successful, because, as Coty’s (Rimmel brand’s owner) staff admitted, it was very hard to get people to download a separate app. Thus, next year, the company decided to partner with Facebook in developing a Camera Effect as a part of closed beta group, hoping to reach a wider audience. When it comes to marketing, there are a few other reasons to choose Facebook Camera Effect over developing an app with ARCore or ARKit (Android and IOS AR utilities respectively), like the cost and complexity of app development or possible limitations of older devices in using the app. Nevertheless, the greatest advantage of Facebook or Snapchat AR solutions are the groups of customers, which come with them. The possibilities of gaining an audience on Google Play and App Store are virtually nonexistent in comparison to social media platforms. It is fair to say that the idea of bringing together an AR experience and Messenger Chatbot allows us to have a look at the future of online shopping. You can try the products on, ask your friends for opinions and shop stuff directly via Messenger, just like that. And although the AR on Messenger is still unavailable a few months after F8 Conference, a very similar experience is achievable by linking to Facebook Camera Effects inside Messenger Chatbot. Another great example of a make-up effect is that made for SEMILAC. It stands out from the crowd by offering almost 50 make-up possibilities and a very high quality. Read more and try it here. Another practical application of AR in marketing is creating a little “how to” experience. While in this case it doesn’t have to be a full instruction, it can act as a simple visualization of how a particular product is meant to be used and how an anticipated effect will look like. It surely makes a product more comprehensible (an especially important thing if the product is innovative) and helps popularise the brand, which decides to take such step to bring clients closer to it through AR. Even if the first beauty industry Snapchat Lenses where created over 2 years ago, it is fair to say that AR will be used more and more. The spectrum of brands that already used AR formats on social media is pretty impressive. Maybelline celebrated National Lipstick Day with introducing Loaded Bolds Lens for Snapchat. Urban Decay promoted it’s Vice Lipstick with a “kissing” Snapchat Lens, which was used by celebrities such as Kourtney Kardashian and many other social media influencers such as Kristin Leanne. Some of the effects, like YSL’s Vinyl Cream Snapchat Lens, Bella’s Facebook Camera Effect or Make It Big by Lancôme let you choose from different kinds of makeup, while the others present only one shade of lipstick or eyeliner at a time. Rihanna’s Fenty Beauty’s Facebook Filter lets everyone try on RiRi’s favorite Fenty highlighter. And I mean literally everyone, because it’s Rihanna’s goal to create inclusive products which “look gorgeous on all skin tones and against all hair and eye colors” (read more: elitedaily.com). Now we can observe that the past, rather incidental marketing AR actions are slowly being replaced by organized, long-term cooperations. Just over a week ago it was announced that “L’Oréal and its recently acquired Augmented Reality and Artificial Intelligence entity, ModiFace, will have a long-term collaboration with Facebook to create new augmented reality experiences delivered through Facebook Camera products” (read more: mediaroom.loreal.com). Facebook’s AR Studio gives a chance to every beauty brand to develop at a fair price and maintain continuously, absolutely for free its own AR try-on, which will very soon become a must have when it comes to distributing cosmetics online.